How did black cats become associated with bad luck, and with Halloween traditions?. Every year when people begin putting out their Halloween decorations, and we start dressing our homes for Samhain, inevitably the image of the black cat comes up. It's usually portrayed with its back arched, claws out, and occasionally wearing a jaunty pointed hat. Local news channels warn us to keep black cats inside on Halloween just in case the local hooligans decide to get up to some nasty hijinks. The ancient Egyptians honored cats of every color. Cats were mighty and strong, and held sacred. Two of the most amazing goddesses in the Egyptian pantheon were Bast and Sekhmet, worshiped as long ago as 3000 b.c.e. Family cats were adorned with jewelry and fancy collars, and even had pierced ears. If a cat died, the entire family went into mourning, and sent the cat off to the next world with a great ceremony. For thousands of years, the cat held a position of divinity in Egypt. Around the time of the Middle Ages, the cat became associated with witches and witchcraft. Around the late 1300's, a group of witches in France were accused of worshipping the Devil in the form of a cat. It may be because of the cat's nocturnal nature that it became connected to witches — after all, night time was the time they held their meetings, as far as the church was concerned. "In the 1500s, there arose the belief that witches could shape-shift themselves into the form of black cats so they could roam freely about the country wrecking havoc and spying on people... The belief that witches could turn themselves into black cats crossed the Atlantic with the first American settlers and was a firmly-held superstition in New England by the time of the Salem witch hunts." Schlosser goes on to say that spooky stories about black cats became popular in the Southern United States as settlers migrated. Many frightening Southern folktales like the Black Cat’s Message and Wait Until Emmet Comes include ethereal and mysterious black cats who might just be witches or demons in disguise. In addition, a common seafaring superstition was that if a black cat walked onto a ship and then walked off again, the ship was doomed to sink on its next voyage. Around the time of World War Two, when the American tradition of Halloween as trick-or-treat time really got underway, cats became a big part of the holiday decoration. 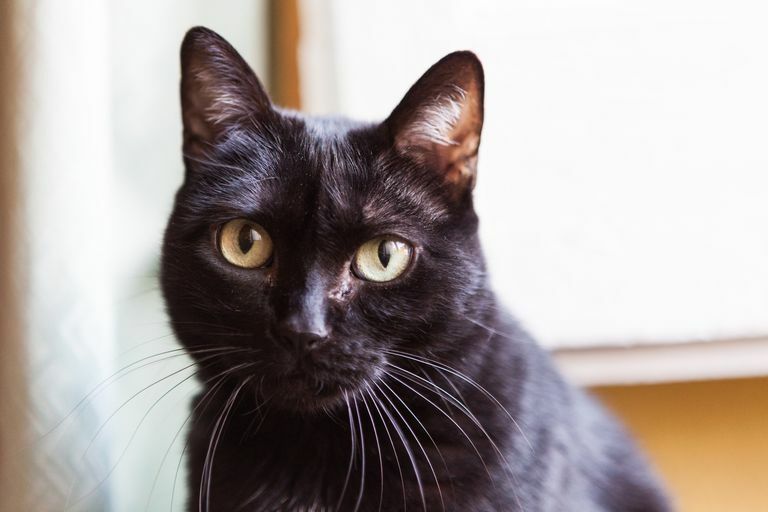 This time around, however, they were considered a good luck charm — a black cat at your door would scare away any evil critters that might come a'calling. In Colonial America, Scottish immigrants believed that a black cat entering a wake was bad luck, and could indicated the death of a family member. If you find a single white hair on your otherwise-black cat, it's a good omen. In England's border countries and southern Scotland, a strange black cat on the front porch brings good fortune. Interestingly, each year around the Halloween season, there are warnings everywhere about keeping your black cat indoors, apparently rooted in a fear that roaming black kitties may be the target of some sort of nefarious wrongdoing, like ritualized abuse and even animal sacrifice. However, the ASPCA (American Society for the Prevention of Cruelty to Animals) has, by and large, debunked this myth, basing the refutation on a 2007 National Geographic article, in which "no confirmed statistics, court cases, or studies to support the idea that serious satanic cult crime even exists." What Do Pagans Mean by Black Magic?